Dana’s poster at the upcoming Sea Turtle Symposium investigates the differences we saw in hatching success of leatherback eggs in nests at Sandy Point National Wildlife Refuge in 2017, before Hurricane Maria, and then in 2018, after the storm. She found interesting changes after the storm. 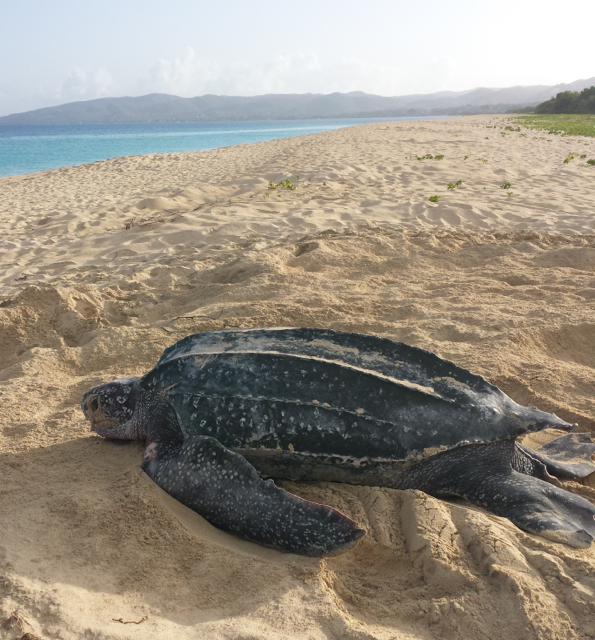 Leatherback nesting season overlaps with hurricane season between 1 June and 30 November annually and both hurricanes Irma and Maria affected the nesting habitat at Sandy Point National Wildlife Refuge in 2017; in particular Hurricane Maria was especially damaging to nesting habitat and removed nearly ten years of sand deposits. The 2017 season had historically low numbers of leatherback nesting throughout the entire Caribbean, and while there was a little improvement in nest numbers in 2018, nesting was still low. The data collected during the 2018 season was used to understand how hurricanes have affected nesting activity and the availability of suitable nesting habitat for the leatherback population. In 2018, turtles had a harder time getting comfortable on the beach and overall they were less successful in laying eggs than the previous year (mainly due to their egg chambers collapsing). Because the sand had been redistributed since the hurricane, it’s possible that it didn’t compact as well as the sand that had been there previously – it was more fluffy than in 2017 and wouldn’t hold the egg chamber shape as well. Hatching success of the nests was also higher in 2017 than in 2018, but in spite of this, 2018 produced more hatchlings that were able to make it into the sea. Dana will be presenting her poster during the first poster session of the meeting on 5 February, from 5:45 to 7:00 pm. We are so looking forward to this! Dana takes notes about injuries on a nesting turtle at Sandy Point during the 2016 season.